Store shelves are packed with brightly colored bottles and boxes and bags of laundry detergents all claiming to get your dirty clothes white, bright and smelling great. How do you ever decide which product is best for you? Price? Advertising claims? The one your mother used? It can be very confusing. One of the first ways to save money on laundry detergent is to assess the state of your normal laundry loads. If your laundry is only lightly soiled from normal wear in an office setting, you probably don't need a heavy-duty detergent like Tide or Persil that are formulated to remove the toughest soils. A less expensive brand should take care of the soil. 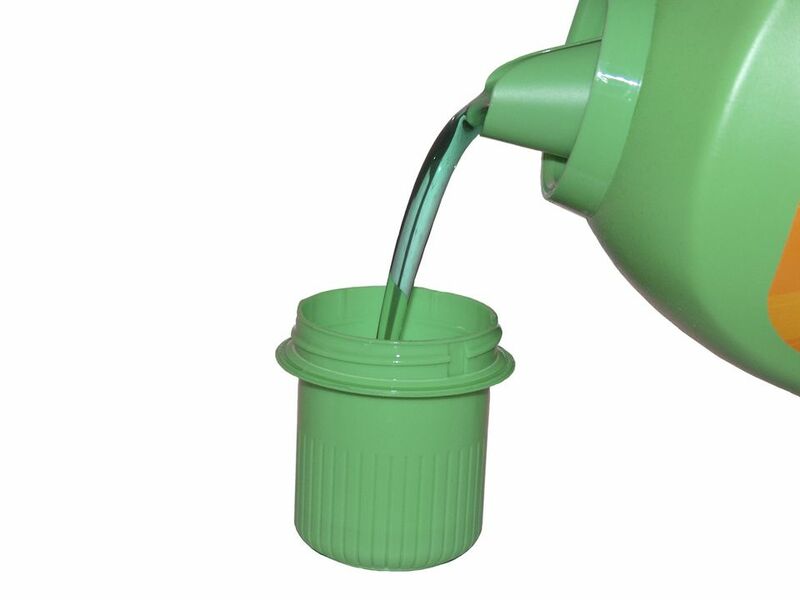 You do need a heavy-duty detergent with enzymes to remove heavier soil. It may pay to have two products on hand for different types of laundry. Unless directed by a pediatrician, you do not need a special "baby laundry" detergent. Any fragrance-free and dye-free detergent can be used. They are less expensive, gentle on baby's skin, and can be used for the entire family. As detergents have evolved through the years, you now find 2X, 3X or even 6X concentrated formulas. The old routine of filling the lid cap to the brim is wasting hundreds of dollars during the year. Washers have also evolved. Today's high-efficiency front-load and top-load washers use much less water than a standard top load washer. You should never use more than two teaspoons of high-efficiency (HE) detergent in a high-efficiency washer. First, read the product label. Determine how much detergent is actually recommended for a full load of laundry. Next, try your best to read the measuring lines inside the cap. It is often quite difficult. Once you find them, use a permanent marker to highlight the different amounts. The next step is to pour the correct amount for a normal load into the cap. Next, pour the detergent into a glass measuring cup. This will help you see exactly how much is recommended. Now, pour half of that amount back into the bottle or box. You are now left with the correct amount of laundry detergent. I suggest that you find a glass cup or an old jar and mark it with this new amount. Use it to measure the detergent each time. It will prevent overdosing. Using too much detergent is hard on your washer and can leave residue on clothes even after rinsing. Having lots of suds does not mean the clothes are getting cleaner. More suds means more of a chance for dirt to redeposit on clothes. One last tip, NEVER pour detergent directly from the bottle into the washer. It is too easy to overuse. Making your own laundry detergent is much easier these days than when women stirred and stirred tallow to make soap or worked with ashes to make lye soap. With a quick trip to a discount store or wholesale club, you can make your own detergent for just pennies per load. Most laundry detergent "recipes" include baking soda, borax or washing soda, and pure soap. Homemade laundry detergent can be used in both standard washers and in high-efficiency (HE) washers. You'll save even more money if you skip the fabric softeners and use distilled white vinegar instead. You will be amazed at the difference in cost per load between detergents. If you choose single dose packs over bulk packaging, you will be paying a higher price for the convenience. Only you can determine what is more important to you, the ease of use or cost. When calculating the detergent cost per load, do not look at package weight or size of the bottle or box. You must calculate the per load cost by dividing the price by the number of loads specified on the packaging. This will give you a cost per load for detergent. Then, remember that you can use one-half the amount recommended, so your cost was just cut in half. This only works on bulk liquid or powder formulas. Single-use packs cannot be divided in half so take that into consideration before you grab the "easy to use" products. When you find laundry detergent on sale, it is a great time to stock up if you have storage space. Laundry detergents store well and have long expiration dates. By following laundry detergent brands on Facebook and Twitter or visiting the brand's website, you can get coupons and free offers that will save you money.